April 1922 Left elementary school at the age of fifteen and joined Art Shokai, a Tokyo automobile repair business. 1923 Selected to work on racing cars being made by Art Shokai. The second race car they made was the “Curtiss”, first raced on November 23, 1924, and which is preserved in the Honda Collection Hall. This experience marked the beginning of Soichiro’s enthusiasm for motorsports. 1936 With the help of an acquaintance by the name of Shichiro Kato, set up the Tokai Seiki Heavy Industry, or Tokai Seiki to manufacture piston rings. The Art Piston Ring Research Center was established at the same time to do the development work. 1939 After successful trials, he handed over Art Shokai Hamamatsu branch to his trainees and joined Tokai Seiki as president. After nearly two years of perfecting the manufacturing process, Tokai Seiki was in a position to supply mass-produced parts to companies such as Toyota and Nakajima Aircraft. At the height of the company’s success it employed more than 2,000 people. 1942 Toyota took over 40% of Tokai Seiki and Honda was “downgraded” to senior managing director. Faced with a work-force made up largely of women, Honda put considerable effort into improving the automation and safety of the manufacturing process. 1942 At the request of Kaichi Kawakami, President of Nippon Gakki (now Yamaha), Honda also invented an automatic milling machine for wooden aircraft propellers; previously it had taken a week to make a single propeller by hand, but now it was possible to turn out two every thirty minutes. September 1, 1946 The Honda Technical Research Institute was established at No. 30, Yamashita-cho, Hamamatsu City and began work on a motorized bicycle. September 1946 Mr. Honda saw a generator engine designed for an Imperial Army No. 6 wireless radio at the home of a friend and the idea was hatched to use this engine. It was this encounter that gave birth to what would become the Honda Motor Company and, therefore, determined Soichiro Honda’s whole future direction. October 1946 The Honda auxiliary bicycle engine was put on the market. Starting with the basic generator engine, Honda overhauled and improved the engines, fitted a custom drive mechanism and installed them onto bicycles for sale to customers. March 1947 Kiyoshi Kawashima became the first member of the company with an engineering degree. September 24, 1948 Founding of the Honda Motor Co., Ltd. It was capitalized at ¥1 million. Including President Soichiro Honda, there were 34 employees. 1973 Honda retires as President of Honda Motor Company, but remains a director. 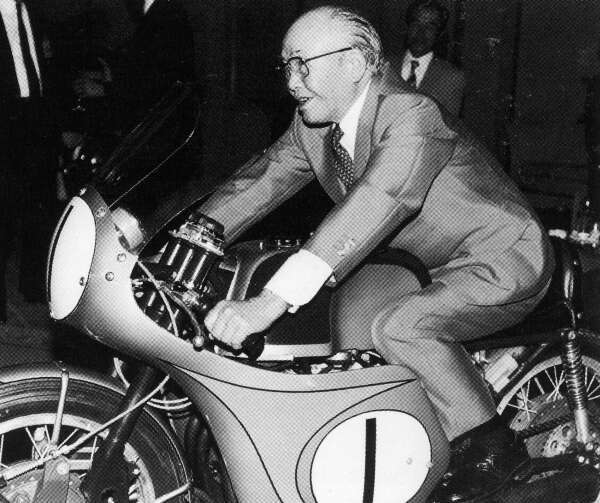 August 5, 1991 Soichiro Honda dies of liver failure at age 84.